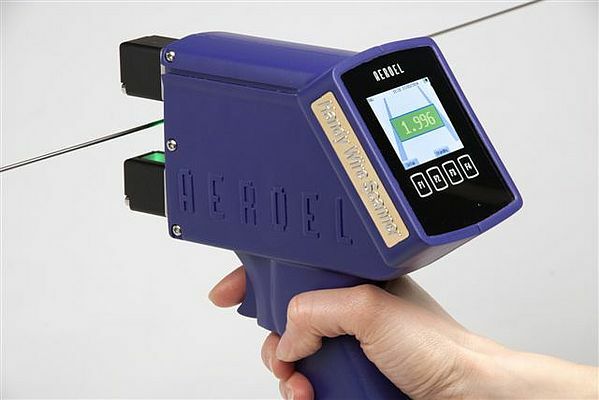 The HWS.1 Handy Wire Scanner from Aeroel is a fully portable optical micrometer for non-contact measurement of wires, cables and other similar products. Developed by Aeroel with LED and CCD technology, it uses 2 crossed linear sensor to automatically compensate positioning errors.Thanks to a powerful single chip microprocessor, the micrometer is liberalized and compensated to obtain the maximum precision in the entire field of measurement, regardless of an accurate positioning of the wire. The measurement is started by pressing the trigger and takes only a few seconds, the display provides the operator with interactive information to place the wire in the useful measurement area and displays the measurement result. All measurements are saved in the memory of the scanner, associated with the date, time and the number of machine: through a USB connection, data can be downloaded to any PC.